Is a Wall Furnace the Right Choice For You? Find Out Now! Rewind history by a century or so and you would have to spend the winter with your entire household cozied up to a wood-burning fireplace or pot-bellied wood stove to keep warm. Sounds fun, right? Thank goodness for modern technology! The earliest actual furnaces (called “octopus furnaces” for their intricate network of individual ducts pointing every which way) used coal as fuel. They sent heat through the duct network as blasts of warm air. Today’s furnaces are far more evolved in how they use fuel and what kind of fuel they use. They are also much more energy efficient and safe to operate. Best of all, there are many more furnace options to suit a vast array of different-size spaces and heating needs. In this post, we will look at one of our newest additions here at Shipton’s Heating & Cooling: the high efficiency wall furnace! 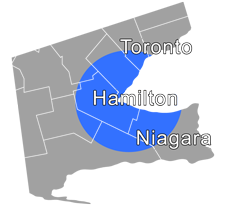 If you’ve been following along here on the Shipton’s blog for some time, you probably know we are coming up on a century of serving the heating and cooling needs for the Hamilton community and surrounding areas. Over the last 10 decades, we sure have seen lots of changes in how homes and offices get heated! 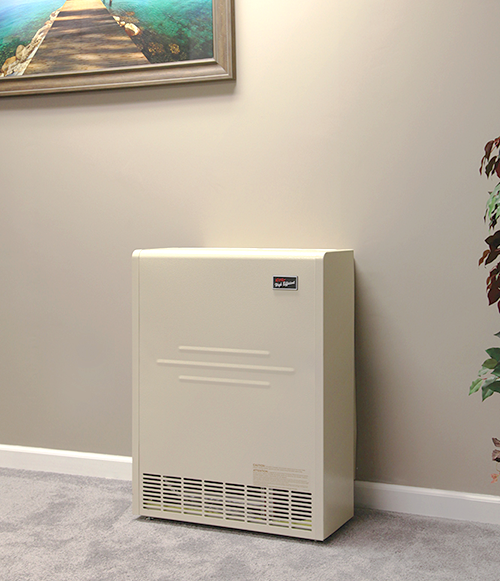 But in our opinion, this lovely little direct vent wall furnace by Cozy (what a great name!) is one of the hands-down best. The Cozy high efficiency wall furnace is petite and compact. It runs on natural or propane gas. It installs off the floor for child and pet safety as well as saving space. The combustion area is completely safety sealed as well as efficient as the furnace pulls combustion-ready outside air in from outdoors and exhausts stale inside air outdoors again. This furnace draws in cooler air from higher up in the room, heats it, and emits it nearer the floor, causing an ongoing cycle of warm air rising so the whole room stays nice and, well, cozy. The furnace has two sets of louvered heat output vents on the unit's front and another two sets on top of the unit to ensure even heat distribution throughout your space. With its compact design, this furnace even includes a telescoping vent system, complete with an outdoor exhaust vent cover to prevent intrusion from bugs or other unwelcome visitors. You can choose between a standard wall or bulb stat thermostat system to regulate the heat throughout your space. Each option is programmable and will remain operational even if you have an electric power outage. The burner system is stainless steel and easy to remove for inspection and cleaning. A safety pilot and pressure regulator is also built into the unit so you are always in control of operation and output. The ignition system is match-less and manual, so you get all of the safety and all of the energy control a furnace can offer. All you need to do to activate the burner is push a button. Once operational, the unit is whisper-quiet, meaning you can even install it in a bedroom setting. The unit itself is an attractive ivory colour over stainless steel to complement any décor. The unit also comes with a 10-year non-prorated manufacturer’s warranty. The Cozy high efficiency wall furnace offers three key attributes to help you conserve energy and cash. Each of these attributes harnesses the natural airflow inside your space to minimize wasted energy. Fan forced efficiency. The more efficient fan in this furnace means less energy wasted keeping the unit itself cool. Counterflow heat delivery. By pulling in cool air at the unit top and pushing warmer air out at the base, the heat system ensures accurate, consistent heating temperatures. Sealed-combustion system with direct venting. This safety-first configuration leaves nothing to chance, using a single telescoping vent system to pull in outside air for combustion and exhaust stale air back outside. One of the really neat features the Cozy wall furnace offers is the flexibility to install add-on accessories to accommodate different-sized and multi-room spaces. In addition to a base unit design that permits easy template-based installation on any outside wall of your choice, there are several different models to choose from in different shapes and sizes for single and multi-story spaces. Units range from 15,000 BTUs and up. Since we started offering the Cozy wall mount furnace, we have installed them in many different types of spaces, from garage apartments to single- and multi-room home additions, from multi-story commercial venues to vacation rental homes, and from manufactured houses to workshop studios, and more. The flexible sizes and capacities, compact design, and all-inclusive kit system make this wall-mount furnace an easy fix in formerly hard-to-heat spaces. Even better, the low cost of powering this furnace lets you recoup your investment quickly in the form of energy savings. Here at Shipton’s Heating & Cooling, we want to make sure that you spend each winter cozy and warm at a price that is right for you. We offer a wide range of heating appliances to suit any budget and space. We also strive to make maintenance and repairs easy and affordable with our popular Shipton’s Protection Plans. These annual plans guarantee you savings in multiple ways, including valuable discounts on labour, parts, and repairs. P.S. Our Indoor Air Quality event is still going on! Right now, when you purchase a new HVAC/furnace combo, you can pick one of three IAQ appliances FREE!